Noga Ambulance provides education services to our community. We are proud to offer a variety of programs. 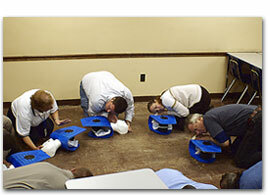 CPR/AED, first aid, workplace safety, ambulance demos, and kid’s safety classes are all available. We encourage local businesses and the public to take part in these classes. Click on the links to the right to learn more. Noga Ambulance also takes part in many community events. Providing educational classes and safety demonstrations at local venues…. Contact our Outreach Coordinator today to set up a demonstration for your organization.